Arden and I are on a bit of an exploration of architect-as-career, as regular readers know. 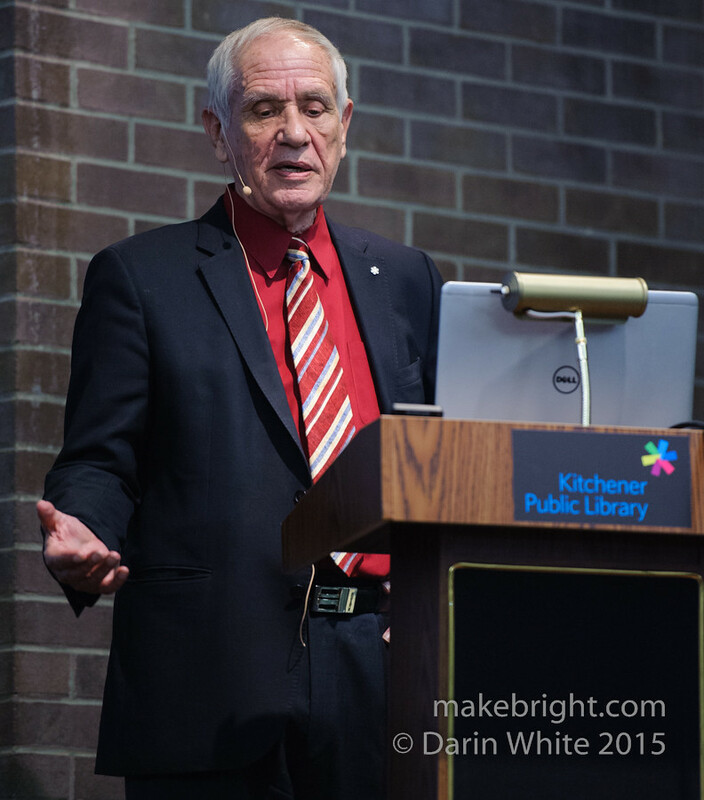 So when I saw that Canadian architect Douglas Cardinal (above) was speaking at the Kitchener Public Library on Tuesday, I signed us both up without really knowing who we were going to see. So it goes when you dive into a new domain. A little pre-outing googling told me that Cardinal had designed the Museum of Civilization (now renamed) in Ottawa that we totally loved during our visit back in 2010. It was interesting to hear about the inspiration of Cardinal’s curvilinear designs and his grassroots engagement with people using his structures. Cardinal gently lamented our general condition of living in “meager boxes” and described some of the technical challenges that curves pose. In his first commission in 1968 for St. Mary’s Church in Red Deer, there was a computationally formidable set of equations describing the catenary curved roof of cables and concrete draped over the exterior walls. Sufficiently powerful hardware to solve that problem was eventually found in Texas and the roof was built with three inches of concrete and within budget. Later in his career, it seems that politics, bureaucracy, money and egos proved the more daunting challenges. Cardinal described the urgency with which then Prime Minister Pierre Trudeau wanted the Museum of Civilization built and ultimately created a crown corporation answerable only to the PM himself. That mechanism bypassed or at least consolidated the hurdles that would have to be surmounted to complete the site. Cardinal showed a photo of a house built into a hill and wryly observed that while it was called Cardinal Residence, it was in fact his ex-wife’s house now and noted the stresses of the museum project had cost him a 25-year marriage. Underlying the whole evening for me was the regular delight of engaging a new crowd, a new domain, and a new place and feeling completely at home and welcome. That’s characteristic of Waterloo Region. Shout out to the folks of Grand Valley Society of Architects for putting on the event and to the sponsors for paying for it and to the KPL for hosting. Recently-renovated KPL: an awesome space. Nice to bump into my friend Martin De Groot out front on Queen Street. He was heading to the very same event as us. Tons of stuff going on and they have the friendliest most helpful staff you’ll ever meet. 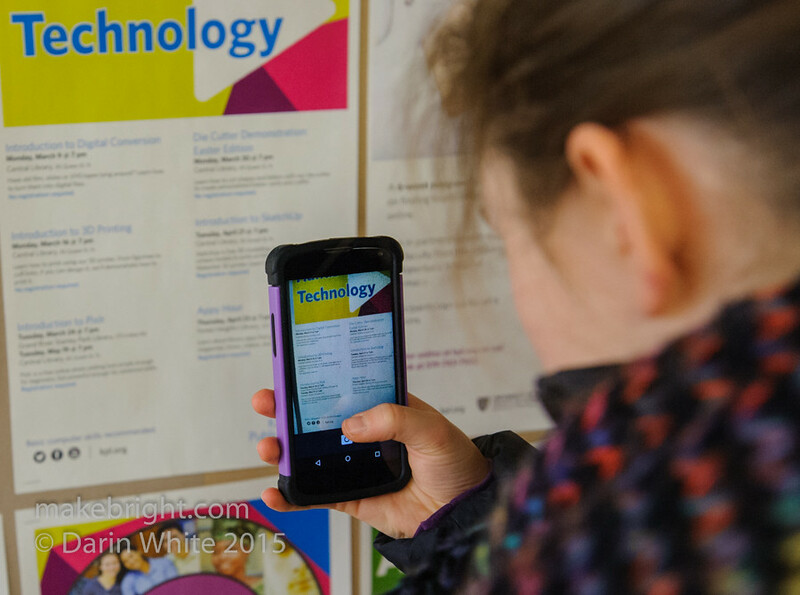 It’s rumoured they have 3D printers in the library, but I didn’t see them. 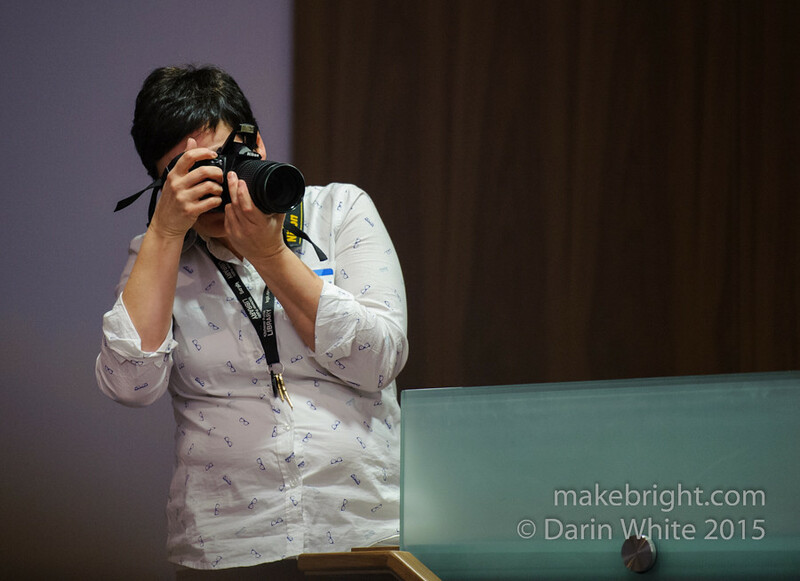 Going to have to catch the next workshop on that. Here’s Arden recording the upcoming tech gigs. We came very early, knowing it was a sold out event. If you want to get decent photos, half of trick is just sitting near the front of the church. There’s my Arden in the third row in blue. The room filled up quickly after this and I heard there was an overflow room in the building receiving a simulcast from our side. 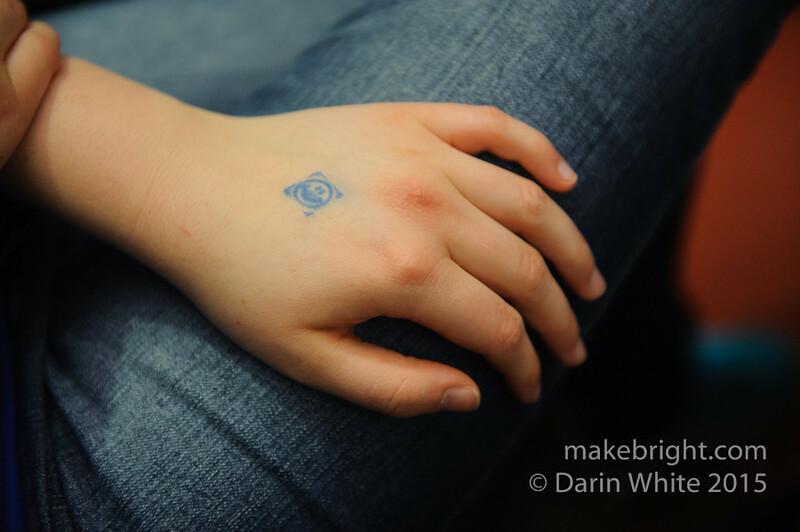 Hand stamps for all of us successful pre-registrants. My friend (and architect) Simone Panziera (right) who, I later learned, is also a board member with GVSA. In the lobby before the show, Simone suggested some of the greatest revolutionaries emerge from the ranks of architects. The more I read about architects like Cardinal, I.M. Pei, Frank Lloyd Wright, Frank Gehry, Zaha Hadid, and Moshe Safdie, the more I’m inclined to agree. With Simone is Charlotte Prong, KPL Marketing and Communications Associate, with her game-face on and judging from her online footprint she is a media force-of-nature. 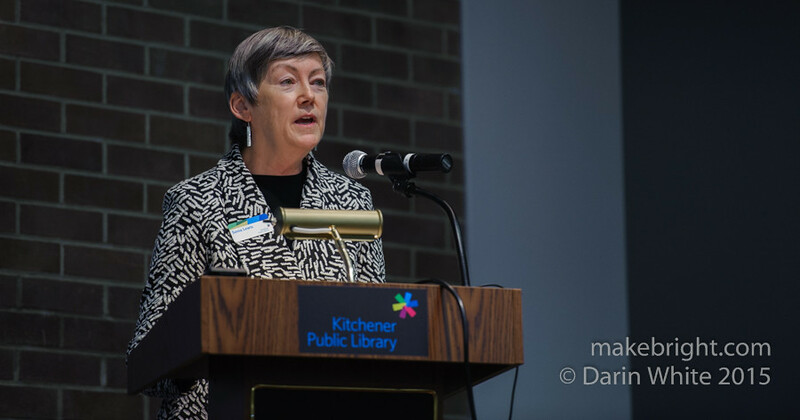 KPL CEO Sonia Lewis joked about the library being Kitchener’s living room and it’s true. It’s a powerful thing to be that in the community. The evolution of libraries in my lifetime gives me hope for the future. Before The Internet, the Point Edward Public Library was my window on the world. 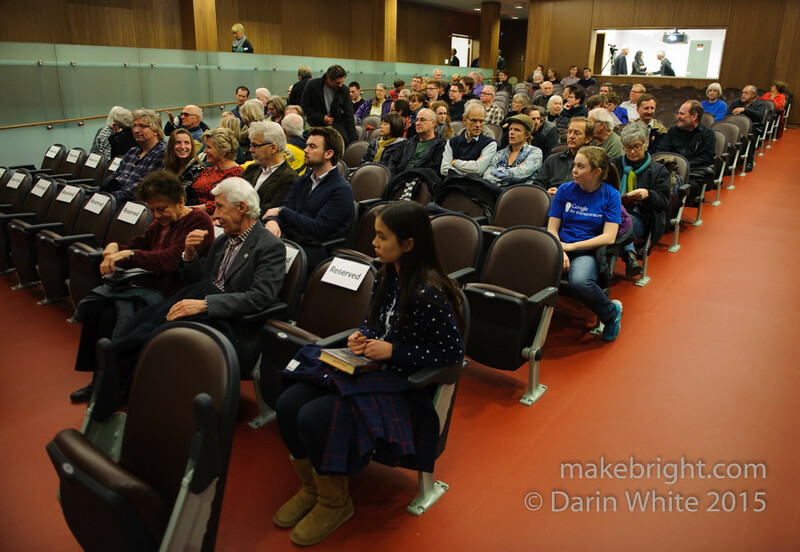 Housed in a small building, it was allocated only a third of the space, with the fire hall and council chambers taking up the other two thirds. But it was my path to loving language and writing and fed both the fiction and non-fiction halves of my young brain. I recently explained card catalogues and the Dewey Decimal System to my kids and they thought I was joking. Hard for them to imagine a world where you can’t search the library catalogue from home and put a hold on a book for pickup when it’s ready. 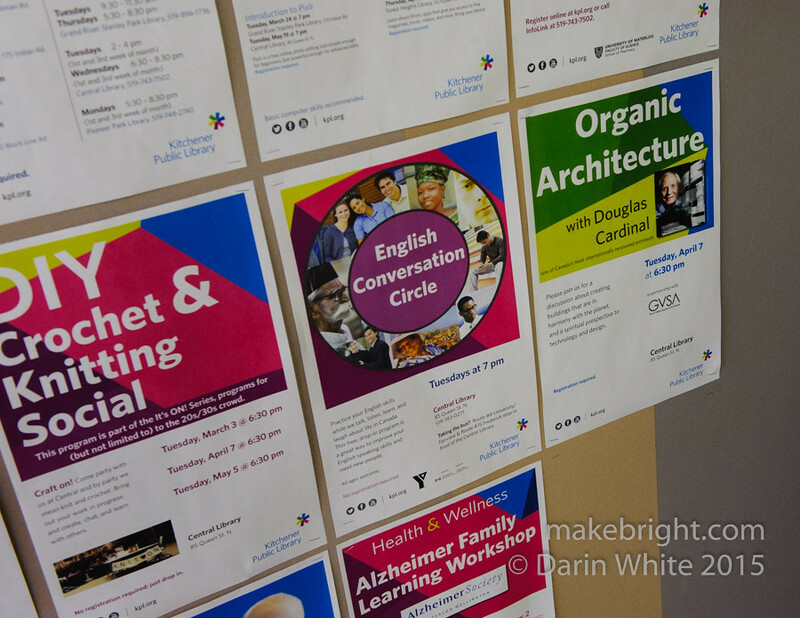 Now at the library you can learn to knit, learn Mandarin, talk about your favourite book, hear live music, see a movie, and listen to an architect talk about a life’s work. 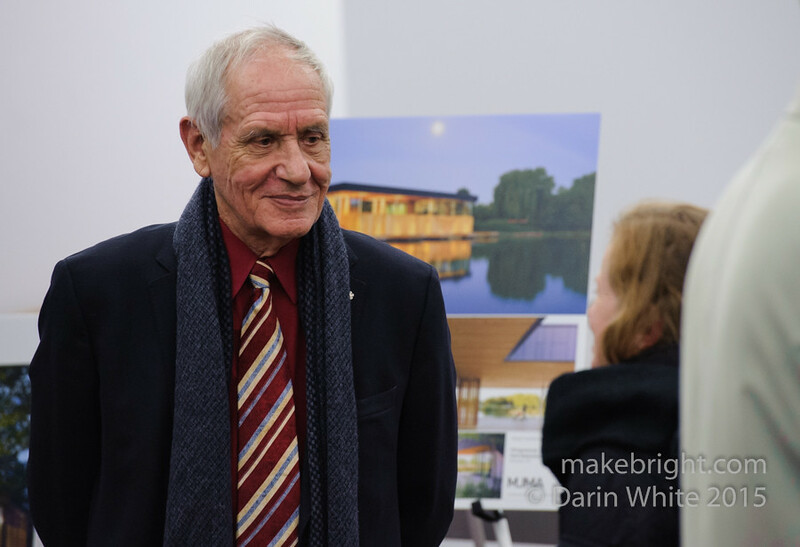 Architect Bill Birdsell, past president of the Ontario Association of Architects said a few words. I didn’t get a good photo of GVSA board member Yvonne Ip who was shepherding questions at the end of the talk. 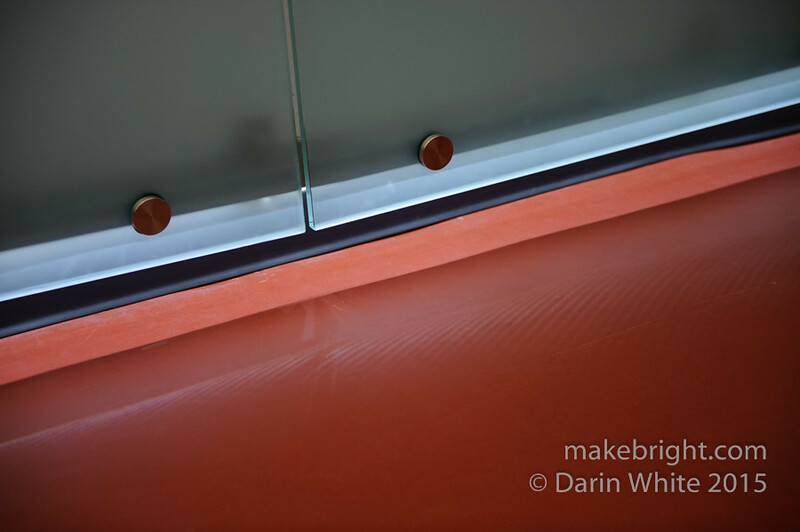 I was splitting my time that evening between being a Dad and capturing the story. Next time! Cardinal started off his talk reading text from his slides but later went into more free-style anecdotes and observations. 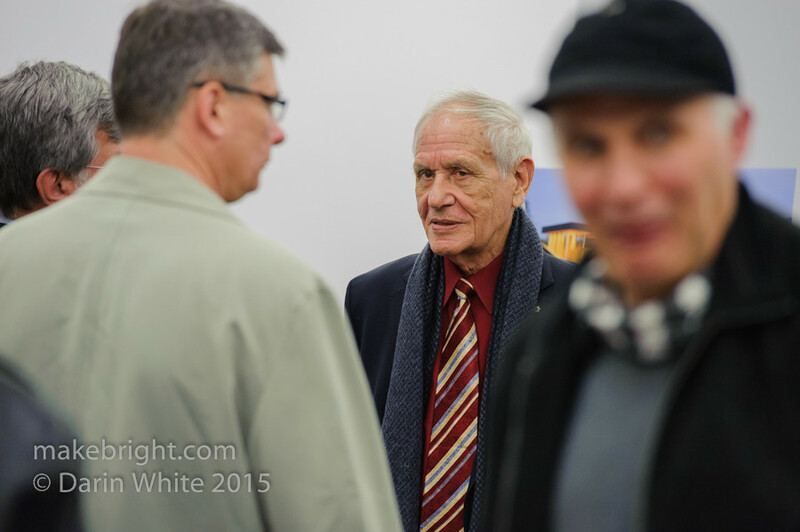 He touched substantially on Canadian injustices to First Nations peoples, noting an “apartheid system” still at work. 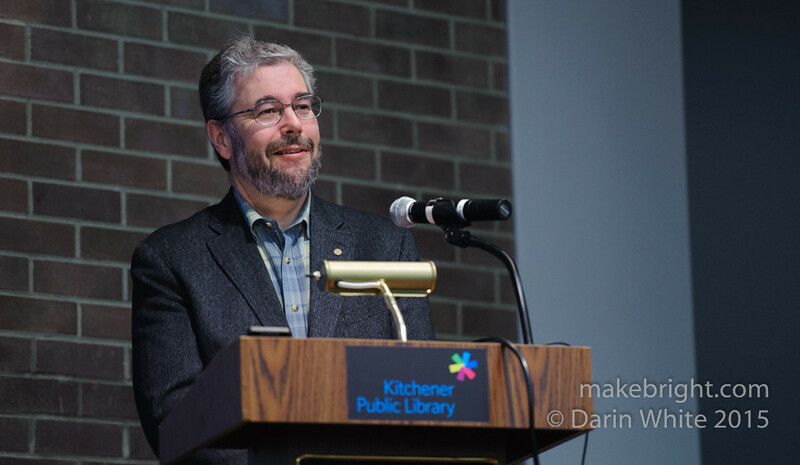 He talked about the aboriginal perspective of planning for seven generations. It’s not the first time I’ve heard of that, but it always makes sense to me and is in sharp contrast with the more familiar focus on the next financial quarter or political term. We really do plant our trees for the next generation. My daughter Arden and I talked on the way home about what it means to have done 60 years of work, to have successes and failures, and to patiently listen for wisdom. It’s hard to remember now what my lens was like at 14 years old, but I know she is already a good mix of observer, thinker, and actor. Glad to have had this opportunity for exploration. From Queen Street, this is Kitchener. 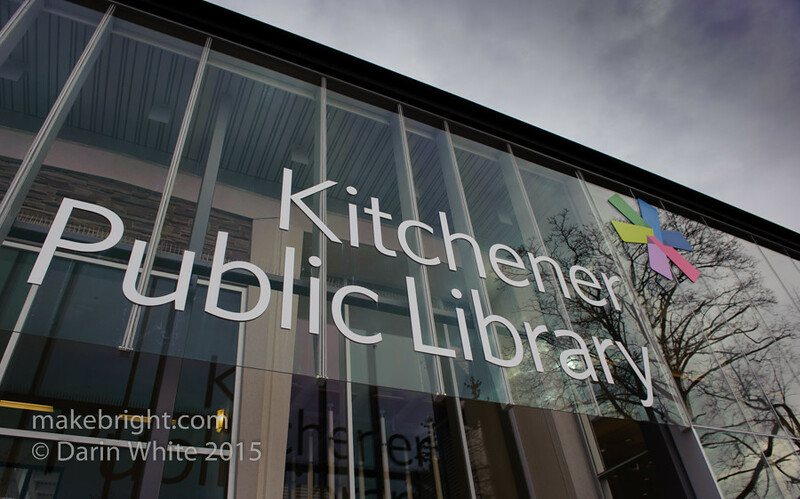 This entry was posted in event and tagged architecture, Kitchener, KPL, library. Bookmark the permalink. Great coverage and reflections! A colleague of mine was a lucky early registrant too. Having been inspired by Douglas Cardinal’s St. Mary’s at about the age of 12, she b-lined to where she is now. 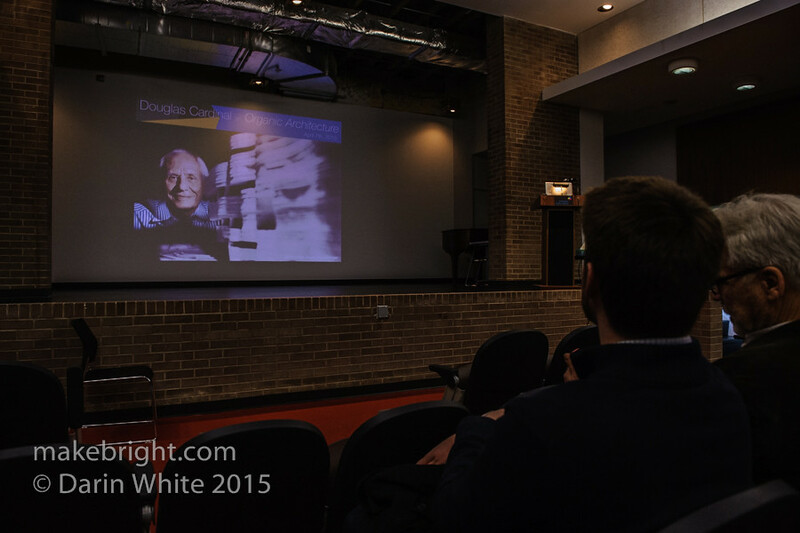 I hope the lecture gave you and Arden more lead down the architect’s path. BTW, I am not at all photogenic, and think you must be a great dad!